If your grocery bill is getting out of hand because of the cost of meat, maybe it's time you thought about making some of your meals meatless. Legumes like lentils are not only a cheap source of protein, but are also fat-free, high in fiber and rich in a number of essential nutrients. Adding lentils to your diet offers a number of health benefits, from helping you control your weight to promoting heart health. With almost 8 grams of fiber in a 1/2-cup serving, lentils are high in fiber. Most Americans get 15 grams of fiber a day, but need 25 to 30 grams. Eating more high-fiber foods like lentils not only helps you meet your daily needs, but might also help you better manage your weight. Fiber in foods helps suppress appetite, and eating an extra 14 grams of fiber a day may help you decrease your caloric intake by 10 percent, according to a 2001 article in "Nutrition Review." Iron deficiency is the most common nutritional disorder in the world, according to the World Health Organization. Not getting enough iron in your diet can deplete your stores and cause you to feel weak and tired. 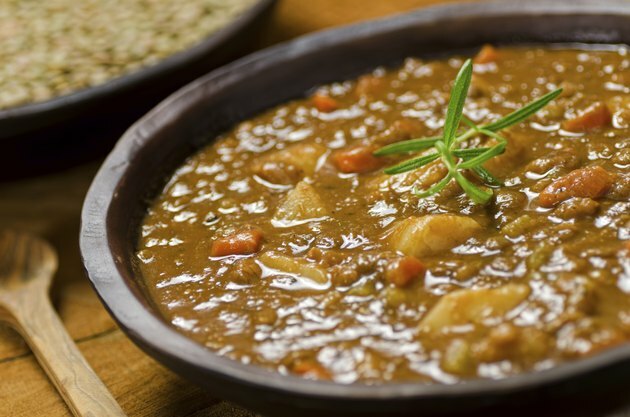 Lentils are a good source of iron, with 3.3 milligrams in a 1/2-cup serving. Women need 18 milligrams of iron a day, and women over the age of 51 and all men need 8 milligrams a day. However, your body can't absorb as much of the iron from plant-based lentils as it does from meat sources. Eating your lentils with a food rich in vitamin C, such as peppers, can help improve absorption. Lentils are also a good source of folate, containing 179 micrograms in a 1/2-cup serving. Folate is a B vitamin that helps your body make new cells. It is a nutrient especially important for women. Adequate intakes of folate before and during pregnancy help prevent brain and spinal cord birth defects in babies. Women who are not pregnant and men need 400 micrograms of folate a day, and women who are pregnant need 600 micrograms a day. Including lentils in your diet may also help prevent chronic illness. A 2012 study published in the "Archives of Internal Medicine" found that adding 1 cup of legumes like lentils to the diet of people with diabetes improved blood sugar, cholesterol and triglyceride levels and slightly lowered blood pressure.